I think its possible to access old German railway timetables, If so you may be able to ascertain more information on train number 1352. BasSWarwick, thanks for the suggestion. I will check on old German railway timetables. APPENWEIER Bahnpost cancel is APPENWEIER-OPPENAU. AACHEN Bahnpost is AACHEN-CASSEL, and it is 1902. First KÖLN Bahnpost is KÖLN-TRIER, and the year should be 1955. Second KÖLN Bahnpost is KÖLN-FRANKFURT (MAIN). PostmasterGS, thanks very much for the additional info. 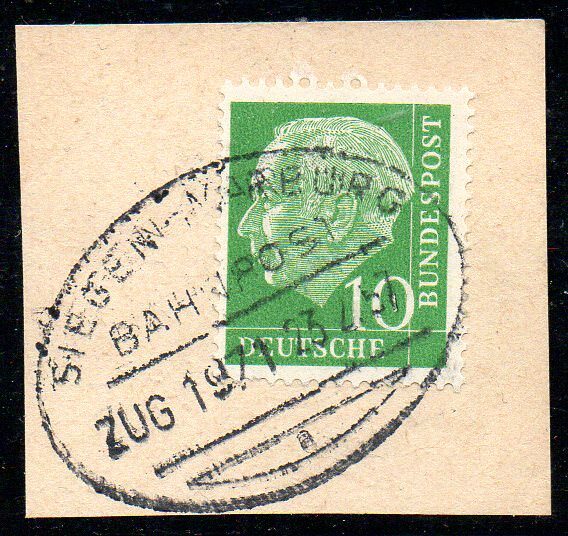 With regard to the first KOLM postmark, I thought that the year was more likely 1955 but I didn't think a 1930s Hindenburg Deutsches Reich stamp was still accepted by the Germany Post Office so I changed by opinion and thought the digit had to be a "3". 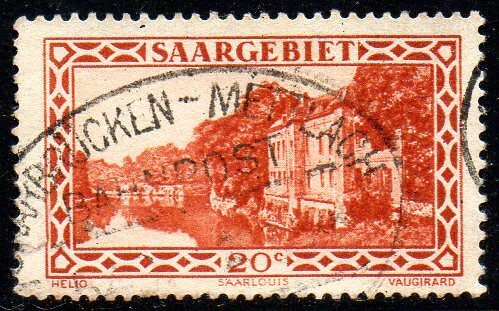 PostmasterGS, are you getting your info on these German Railway postmarks from the site that Darkormex mentions in his original post ( www.stampsx.com/ratgeber/stempel-datenbank.php ) If so, I haven't been successful in using search criteria to narrow down the results. I just enter "bahnpost" and get several hundred results. Is there a way to enter the name of a railway line or ZUG number to narrow down the search? PostmasterGS , thanks very much for the additional info. With regard to the first KOLM postmark, I thought that the year was more likely 1955 but I didn't think a 1930s Hindenburg Deutsches Reich stamp was still accepted by the Germany Post Office so I changed by opinion and thought the digit had to be a "3". OK. I feel like an idiot. I didn't even look at the stamp... It's 1935. I got distracted by the design of the oval. Most pre-war are plain ovals, and most 1950s-1960s have the smile at the bottom of the oval. This is an exception, as it's pre-war with the "smile". 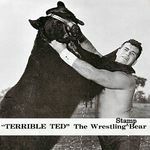 I primarily use StampsX. I also have a book listing all the train routes, but it's just a bunch of tables with no photos and no Zug numbers, so I generally only use it if I can't find a matching design on StampsX. 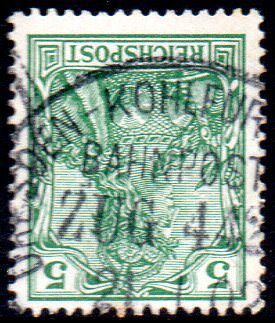 To get better results on StampsX, try putting a portion of the text other than Bahnpost (Ex. AACHEN) in the blank labeled "Text im Stempelgerät oder Teile davon", and select "OV (Ovaler Stempel) in the dropdown labeled "Stempelsorten (grobe Einteilung)". Selecting the oval type will generally get you only Bahnpost cancels, since those were the primary oval cancels in use in Germany. I then compare the letter placement in the pics to find a route that's the correct length and matches any partial letters visible in your scans. 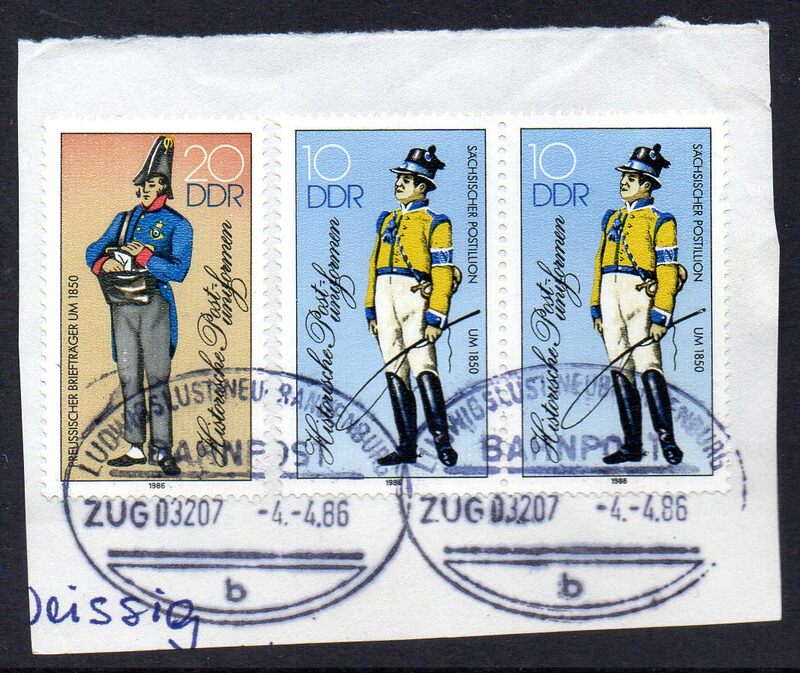 I've just come across some German BAHNPOST railway postmarks and was pleased to find this thread. This is train no. 03207 from 4th April 1986. Here's a pre-war strike on a strip of three stamps. This is train no. 3731 from 1st March 1923. This is train 442 (or 442x) from 21st January 1902. 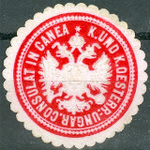 Kohlfurt and Breslau are now Węgliniec and Wrocław.in Poland. Thanks, Nigel, for planting the seed of another postal pursuit in my head. I hadn't seen any before last week and now I'm hooked! These are the first one's I've seen. What is it about trains that make stamp collecting so much more interesting? I found one more complete strike although it's a little blurred. This time it's on a West German stamp. This is train 1971 from 23rd February 1957.